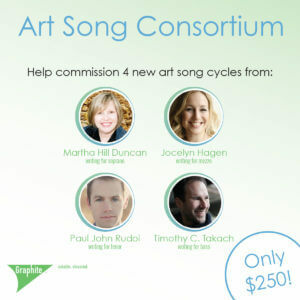 Graphite Publishing is organizing an art song consortium for 4 brand new cycles of art song. Four of our most prolific composers of art song will write a cycle for four different voice parts. As a consortium member, you and your students will give regional premieres of these songs. The buy-in cost is only $250 to get copies of all four new cycles. You’d be helping to bring new art song into the world for $62.50 per cycle! Martha Hill Duncan will write for soprano and piano, Jocelyn Hagen will write for mezzo-soprano, piano and string quartet, Paul John Rudoi will write for tenor and piano, and Timothy C. Takach will write for bass-baritone and piano. Help art song stay relevant and fresh by contributing to its creation. Contact info@graphitepublishing.com for more details. Ready to support? Click here to make a credit card payment through our website.